Self-proclaimed "master of all trades" goat, Mekk Elek, gets hired for various jobs around a village of livestock, and spectacularly botches all of them until it is clearly proven that he is only the master of one. Mekk Elek, az ezermester (Elek Mekk, master of all trades) is a 13-episode stop motion puppet show that originally aired in 1974. In addition to featuring freakishly adorable puppets, it is also linguistic genius, courtesy of Romhányi József, one of the greatest punster-poets of Hungarian history. 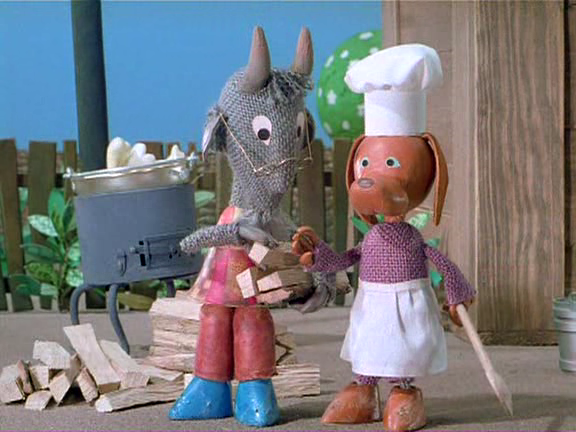 The language of the show is twofold: One, Mekk Elek, the Goat, speaks mostly in eszperente, a language game that only features the vowel "e", which make him sounds like he is actually bleating. In addition, pretty much all animals talk with words that make them sound like the animal sounds they originally make. 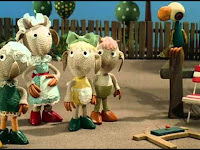 For example, Hungarian goats say "mekk, mekk" - which is not only Elek's family name, but also eszperente. Pigs say "röf, röf" so their lines are written with a lot of words with "ö" in them, etc. If you watch the opening 7-minute episode, you can hear a little bit from all of them. The story itself is as funny as it is real - Mekk Elek truly believes he excels at all the trade he advertises on his signs, and therefore any complaint can only exist because others are too dumb to understand his genius. Over the course of the 13 episodes, Mekk Elek loses each one of his 13 trade signs (as well as the respect of yet another animal family)... until the last one, where he finds out (spoilers!) that he is actually a good tailor. The village accepts him as a tailor, and everyone is happy in the end. I was not surprised that I couldn't find an English version - it would be incredibly hard to translate this show. But you can take a look at it (most of it is very much understandable without the words) on YouTube here. I'm very glad he was good at something :) Does he learn humility along the way as well as he loses his signs? This looks like an extremely well thought-out show! I'm sure it's very enjoyable. Ha! I;m laughing at no one understanding his genius. Yep. We all know people like that. So far, I'm really loving what Hungary is offering :) Sounds like a cute and funny show, keep em coming.